Thanks to James for this one. It is my first medium wattage HPS lamp made by Norelco. The lamp shown here was made in May 1983 and has a simple arc tube support design. James has an older one from 1980 with the cool half-twist arc tube support, Philips was big on that design at one time. I have a French Philips Mazda MAC 150w lamp with that design. Although this Norelco lamp was assembled in the USA, the arc tube was made in Belgium and I suspect the metal parts are also imported except the base which was sourced from GE. Wow, don't see Norelco HID lamps as often as other makes it seems. Neat find! There's more! 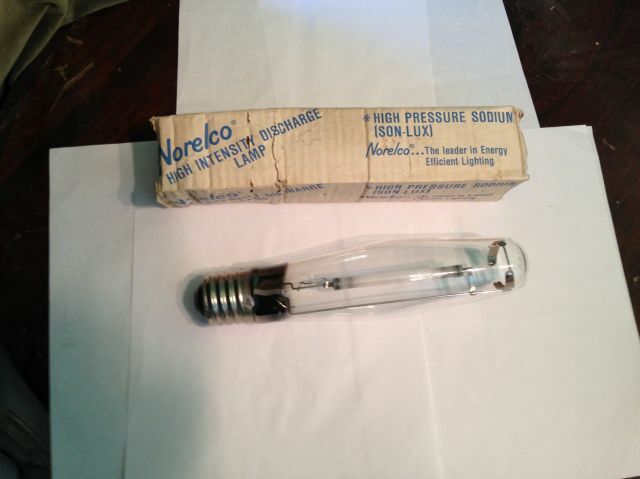 I recently acquired a Norelco 50w Son-Lux med base lamp. That reminds me, it'll be on the next round of uploads. Stay tuned! Interesting! I'd be interested to see that one!